In maybe 1889 my grandfather Per Martin Johansson moved from Lönsboda, Sweden to Wolgast in Pommern, Germany and stayed there until the year 1900, when he left with wife and three children. My grandfather had been the manager of a splint-basket factory in Wolgast, in those 11 years. As former told, he then went in co-operation with his brother Carl E. Johansson in Kvistgaard, Denmark to make splint basket for the Danish market. My father Arvid Johansson was born in Allerød, Denmark 1906, but his elder brother August was born in Wolgast. 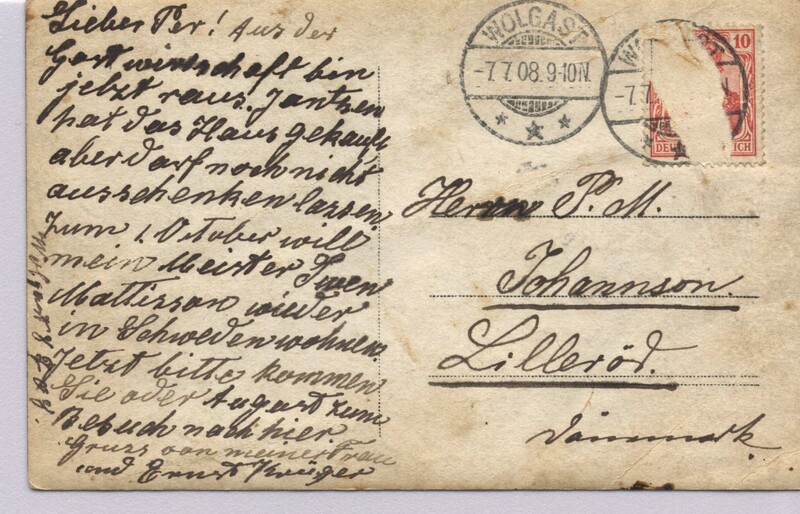 Since August expected me to be interested in the story of our family already when I was a child, he gave me a postcard from 1908, posted to my grandfather by Ernst Krüger, Wolgast. In the DDR-period Wolgast seemed very far away. But at the end of the century I suddenly on a trip to Berlin realised, that it was pretty close to Denmark. 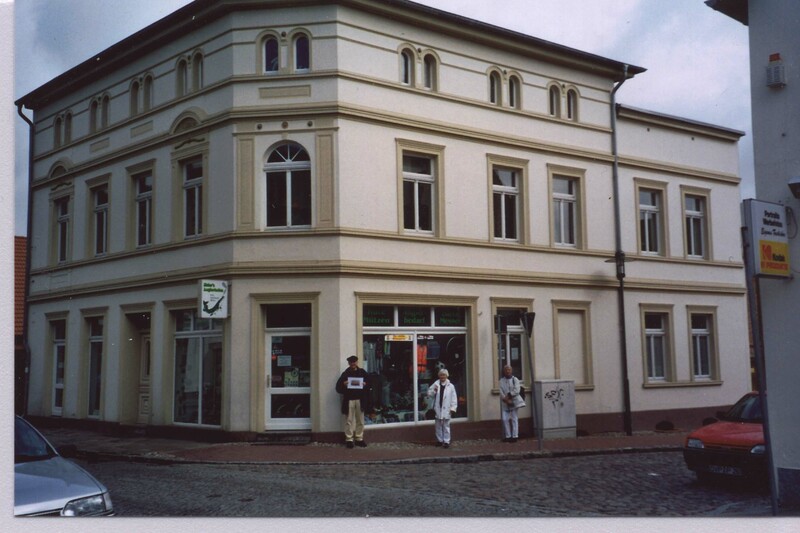 So together with my brother Lennart and his wife Aase, Marianne and I went to Wolgast in the spring of 2001, to see the place and maybe find the house on the postcard. The person with the baskets on his right side is, as I think my grandfather. On the wall the name of Ernst Krüger. Wolgast is becoming part of the modern West, but still with many a corner reminding you of the past. It is like a movie in bright colours with big spots in grey-tone or black-and-white. It is close to the beach so in summertime I think it is a really tourists paradise. But this was in springtime, and we were as tourists among the happy few. We went to the church, as we can guess our grandparents did many years ago, and felt quite at home. We went to the local museum and found it a real modern version and not dusty at all.